Blacktown Police: not Sports Star struck. But Half mast flags are meant for national tragedies and as he wasn't indigenous not sure if they should have half masted that one. 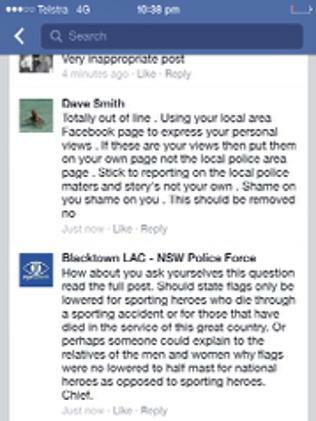 The administrator of the Blacktown LAC page responded to the criticism by asking why state flags were lowered for Hughes’ death but not for people who die “in the service of this great country”. Blacktown police have come under fire over a Facebook post. “Or perhaps someone could explain to the relatives or the men and women why flags were not lowered to half mast for national heroes as opposed to sporting heroes,” the response said. THE Vatican cricket team will attend a mass in Rome for Phillip Hughes, as family and friends prepare to farewell him in his home town of Macksville on the NSW mid-north coast. The Vatican Cricket XI, or St Peter’s Cricket Club, will attend along with representatives from the Pontifical Council for Culture and supporters of the Vatican team. Re: Blacktown Police: not Sports Star struck. AT the same time as less than 6000 people died from Ebola so far this year ~ over a million will have died from Malaria, nearly a million from influenza, and hundreds of thousands each from car accidents, cigarette smoking, and AIDS infections.. The truth remains that anyone reading this probably has less chance of encountering a terrorist attack than falling under a bus or tripping down the stairs at home ! And then, of course there is the disproportionate and biased reporting of incidents in America or Europe while much bigger massacres were occurring at the same time in central and western Africa, the Middle East, Afghanistan and Pakistan.. EVEN THOUGH floods and landslides, cyclones and hurricanes, earthquakes and tsunamis, forest fires and the likes, will kill more people in any year than all of the wars and terrorist attacks combined, they often still only get a fraction of the news coverage ~ and over a shorter duration..
+ "Fracking" technology being used to extract Shale oil and Coal Seam gas..